The Nuxeo Content Services Platform is used by architects and developers to build, deploy, and run content-centric business applications. 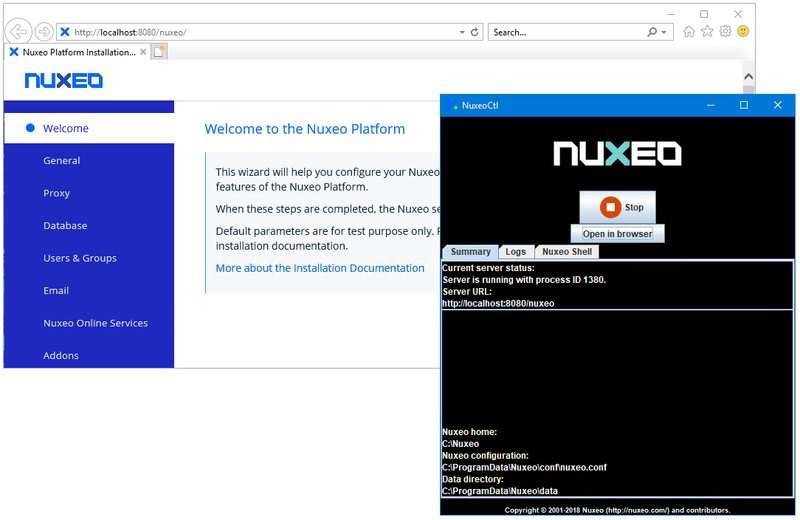 Download, install and configure Nuxeo if necessary. The "console" option instructs Nuxeo to keep important processes alive as it starts. Without that setting, AlwaysUp will notice those processes exiting, conclude that Nuxeo has failed and keep restarting the entire platform. In the Name field, enter the name that you will call the application in AlwaysUp. We have specified Nuxeo but you can enter another name if you like. Click over to the Logon tab and enter the user name and password of the account in which you installed and configured Nuxeo. Nuxeo must run in this account so that it can find its configuration & settings. 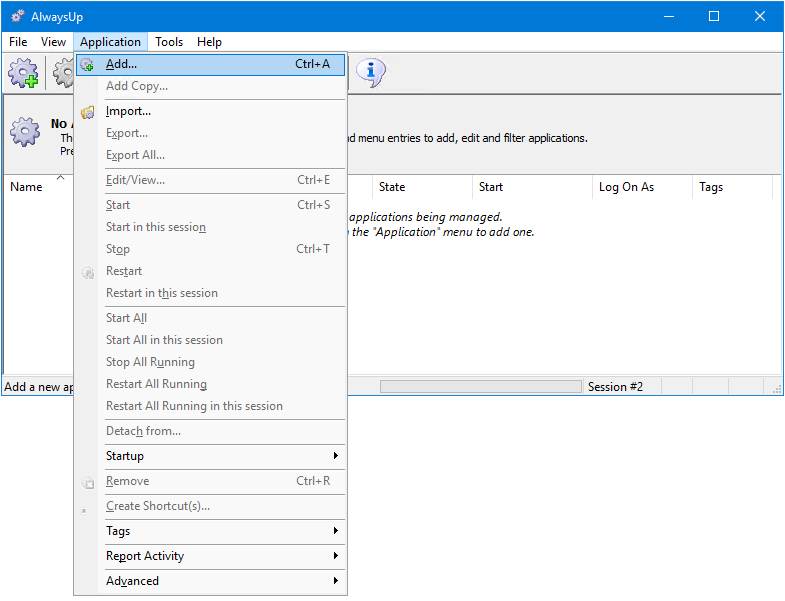 And if the content server will be accessing a network-based repository, move to the Startup tab and check both the Attempt to automatically reconnect all network drives and Ensure that the Windows networking components have started boxes. These will make certain that the network is primed and ready to go when Nuxeo launches. We are now done installing Nuxeo as a service so click the Save >> button to record your settings. 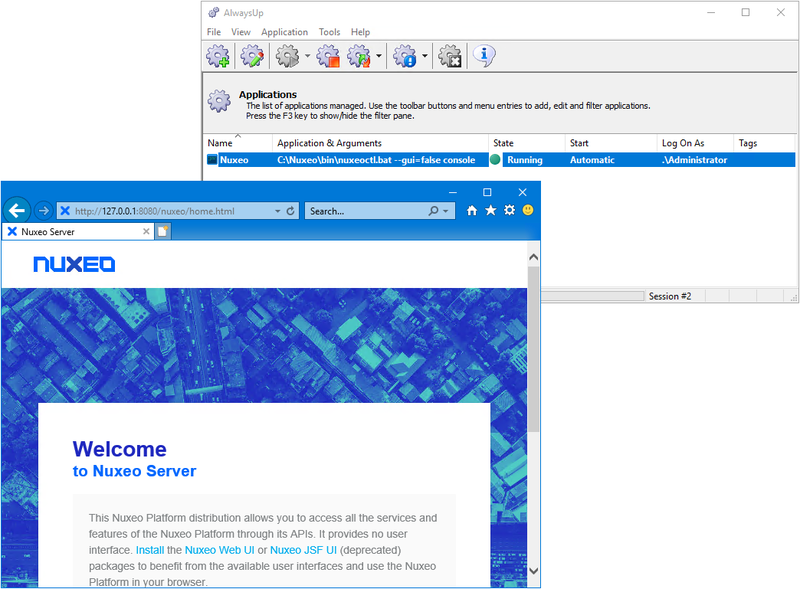 In a couple of seconds, an application called Nuxeo will appear in the AlwaysUp window. It is not yet running though. To start Nuxeo, choose Application > Start "Nuxeo". In a few seconds, the state should transition to Running and Nuxeo will be running in the background. That's it! Next time your computer boots, Nuxeo content server will start up immediately, before anyone logs on. We encourage you to edit Nuxeo in AlwaysUp and check out the many other settings available. You can send email if Nuxeo ends unexpectedly, reboot your server nightly to cure memory leaks, and much more. For your convenience, we have provided an AlwaysUp Settings File with all the settings recommended in this guide. 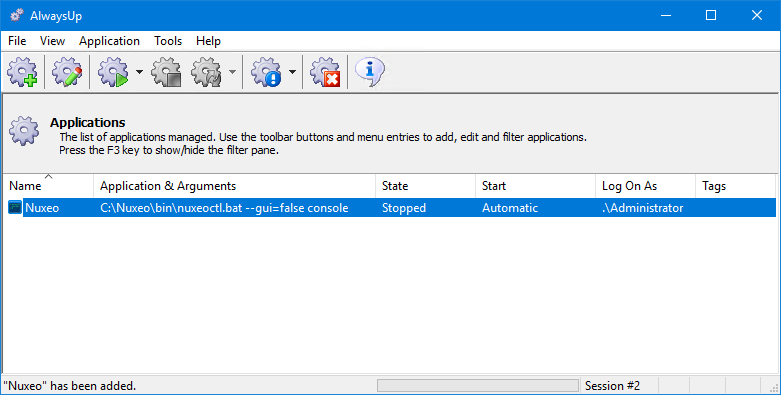 Download Nuxeo_alwaysup.xml to your computer. Please make a note of where you save it. In AlwaysUp, select Application > Import from the menu. Choose the file you downloaded in step 1. 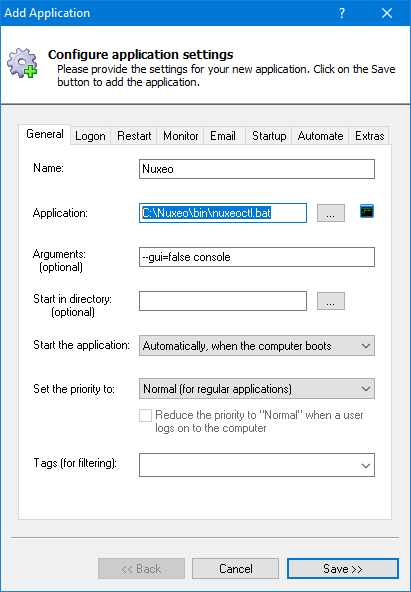 On the Logon tab, delete the placeholder values and enter the username and password of the Windows account where you installed and run Nuxeo. Click Save to record your new Nuxeo service. 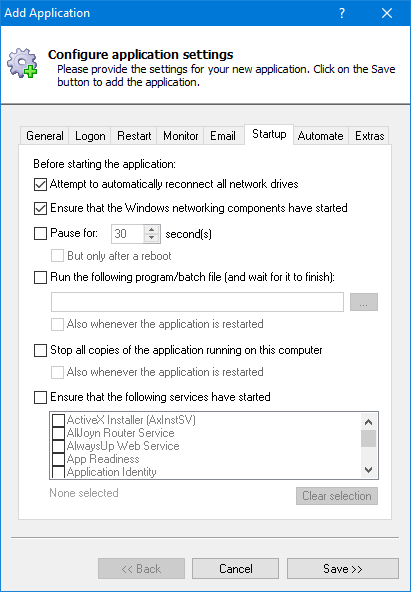 Nuxeo not working properly as a Windows Service? The Nuxeo control panel should pop up on your desktop. Check for errors. 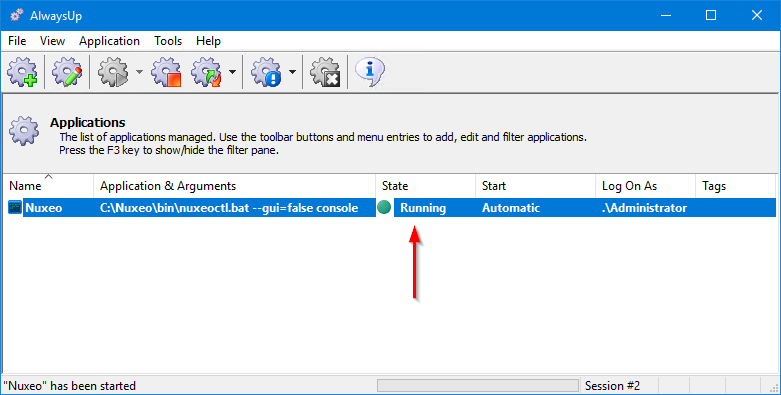 Consult the AlwaysUp Troubleshooter — our online tool that can help you resolve the most common problems encountered when running an application as a Windows Service. From AlwaysUp, select Application > Report Activity > Today... to bring up a HTML report detailing the interaction between AlwaysUp and Nuxeo. The AlwaysUp Event Log Messages page explains the more obscure messages.